If you have a jailbroken iPhone or iPod touch lying around you can can customize it with a Windows 8 user interface theme. 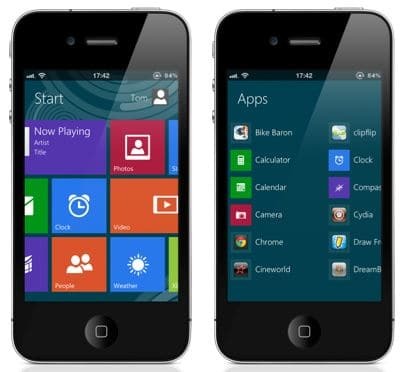 A new Dreamboard theme named Metroon from Cydia brings Windows 8 to the iPhone and iPod touch. Press the ‘Desktop’ tile to get to the iOS interface, press the home button to return . Flick any tile down to see the options for that tile. Press the username to change it. Press anywhere on the screen to get to the all apps view, press the home button to return to the start view. Flick any app down to see the options for that app. Metroon can be downloaded from Cydia for $1.50. This theme requires dreamboard to be installed on your device.